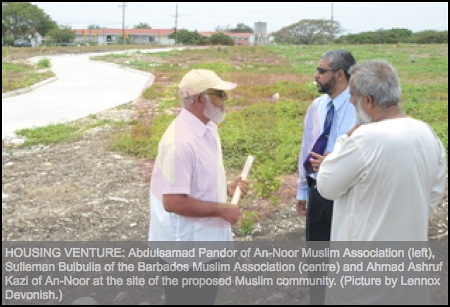 Muslim-only housing development in Barbados. 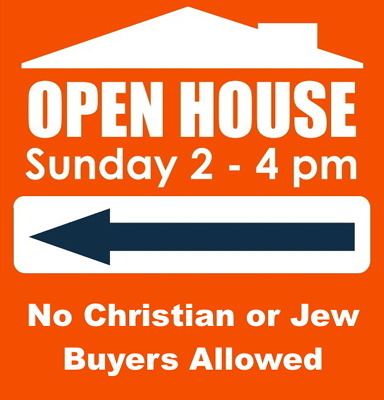 No Christians or Jews allowed to purchase homes in new community. Is this what we want for our Barbados? It’s not a real sign, but it might as well be! One can only imagine the howls of outrage if a construction company announced that only Christians would be allowed to purchase new homes in a brand new Bajan subdivision… and rightly so. Can you imagine on a sign “No Muslim Buyers Allowed” ??? Yet this is exactly what our political class has agreed to in relation to Bajan Christians and Jews when it issued building permissions to the Muslim organisations involved in building Barbados’ newest housing development. After hundreds of years of slavery, and then another hundred years of colonisation, exclusion and segregation based upon race, skin colour and class, ordinary Barbadians do not take kindly to being told they are not eligible to purchase a home because they are not of the proper religion. Bajans do not like being told that they are second class citizens in their own country. The message from the Muslim spokespersons that “Barbadians have nothing to fear” is a statement that these people consider themselves to be outside of the wide and inclusive Barbados citizenship and community. Is this what we want for our Barbados? There can be no debate that these Islamic values and teachings are anti-Bajan, and destructive to our national character. They are against everything that this country stands for. Muslim teaching about the value of women is stuck somewhere before the dark-ages, but for some reason liberals excuse the fact that the Koran not only allows, but instructs, husbands to physically discipline their wives. Yet, our so-called political leadership has agreed to allow the establishment of a community that excludes ordinary Bajans and upholds values that are foreign and destructive to our nation. This is a dangerous precedent that weakens Barbados and undermines everything we have struggled for in the past 150 years. By all means, let people believe what they want to believe no matter how vile or outrageous. Freedom and democracy demands tolerance. But we draw the line when our government gives approval and support to an exclusionary enclave based upon religion and values that are in total opposition to the Bajan culture and national character. I wonder: what would Bussa think of this? Gay marriage in Barbados? Class… discuss! 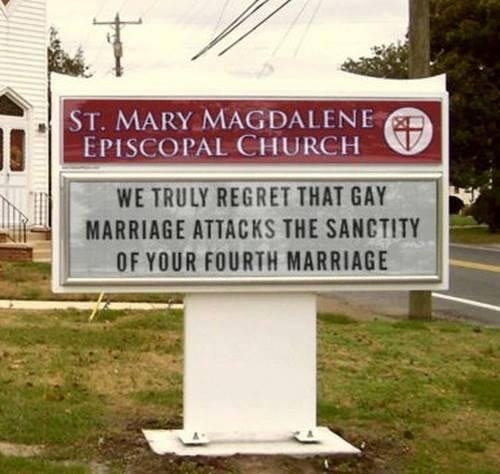 Is gay marriage a one-way ticket to HELL ? If Raul Garcia must be made whole, what about Bajan national Earl Victor who Charles Leacock has been holding in custody for almost five years without a trial and without due process of law? One would think after serving 5 years at Dodds Prison without trial, with the only current charge of procession of stolen property against Mr. Victor would be home with his family. The penalty for handling stolen property in Barbados should not be an indefinite sentence. Mr. Victor’s mother is poor and and can’t afford this kind of money Leacock and Magistrate Worrell are demanding for Earl’s release from custody. After serving a 20 year jail sentence for drug trafficking, and then being held illegally for almost three years by a Barbados Government that refused to obey a Supreme Court ruling, Raul Garcia walked free yesterday. Barbados Free Press published over 20 articles about Garcia in the past year alone. 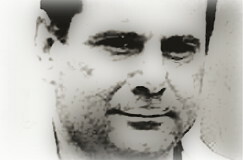 The U.S. State Department issued a Human Rights Report criticising Barbados for continuing to illegally hold Garcia. The Barbados Bar Association took up his cause. And still the government continued to hold Garcia against the order of the Supreme Court. We celebrate today with Raul Garcia, and you know that the Bajan news media will focus on the joy of his release until public interest fades. There will be a few stories later on to say how Garcia is making out… but Bajans should continue to think about how our government ignored the Rule of Law. That is the big story here because it happens so frequently on this little rock that those in power develop an attitude that they are above the law. That’s the real story of Raul Garcia. Tonight, for the first time in almost a quarter of a century, Raul Garcia will sleep in a bed that is not owned by the state. His 20 years of jail time for drug trafficking and more than three years of immigration detention, pending his deportation, came to an end just after 3 p.m. today, when the Cuban national, with hands raised, walked out of the Supreme Court, unescorted for the first time in seven months of hearings. Garcia emerged from the Number 9 High Court Chambers with a broad smile, never before seen since proceedings began in front of Justice Margaret Reifer, hugging members of the Prison Ministries who had been supporting him in his quest to be freed from detention. After spending “a few minutes” immediately outside the doors of the courtroom with his team of lawyers, the family with whom he will live and Prison Ministry officials, an emotional and visibly overwhelmed Garcia, spoke briefly with reporters on the steps of the judicial complex. Thanks to Barbados Today for the photo. You can read Barbados Today’s full story here. “I also have difficulty with the assumption that men are the only people those women have to fear. The first arrests for human trafficking by Barbadian authorities may have done little to reassure the US State Department about the country’s commitment to addressing this stain to its human rights record. This seems to be the gist of a story appearing in the Nation newspaper today. 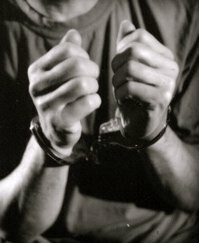 Under the headline “Ring busted,” the local paper reports, “Police have smashed what they believe is a human trafficking ring here, and for the first time have charged individuals with this crime. “As a result, a man and a woman will appear in court today jointly charged with human trafficking,” it continues. The paper also credits unnamed “reliable sources” for informing it that the man, a 22-year-old and the bar’s 36-year-old proprietress were arrested after police found five Guyanese women, dressed only in bathing suits, working in the bar. “The five were between 17 and 21 years old” the report continues. It also says that investigations revealed that the women were not in possession of their passports and documentations and that there was evidence that they were part of a regional trafficking operation. I have just read this article whilst visiting the island as a tourist from the UK and I am stunned that a national newspaper from a modern progressive country such as Barbados would employ a journalist with such prejudicial and homophobic opinion never mind put in print the blatant manipulation of a very complex topic such as colonialism. I will explain further but your editorial staff should be ashamed to promote such borderline medieval opinion, Google results alone paint a poor picture of this gentleman’s past rhetoric and his veiled journalistic style. After more than two and a half years in detention, Cuba-born drug convict Raul Thomas Garcia will finally get his day in court. This afternoon, the Barbados Supreme Court ordered that a writ of habeas corpus be issued, commanding the minister responsible for Immigration and the Chief Immigration Officer to present Garcia in court on Wednesday, October 24 at 9:30 a.m., to justify why they continue to detain him, despite the fact he has served his 20 year jail sentence for the drug trafficking crime. … continue reading this article at Barbados Today: Bring him!